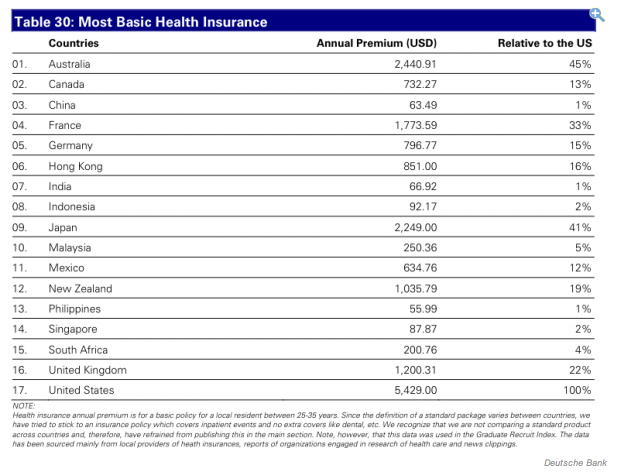 How Overpriced Is US Health Insurance? This chart says it all. The medical-industrial complex and American policymakers should be ashamed. Hat tip Business Insider. 6 Responses to "How Overpriced Is US Health Insurance?" Yes, medicine is in a bubble in the US and only China and other emerging markets can save big pharma and ridiculous device company profits. The US technically subsidizes all other countries low prices by being gorged by pharma and device manufactures. There will be a huge deflation in United States medicine at some point, likely when medicare has to privatize the entire program due to government debt or once ACA is enacted. Poor med students debt bubble will get even larger. Not a fair comparison. A better denominator would be the average wage for the respective country. The doctor in New York will have higher overhead than a doctor in China due to higher rents, better paid nurses/staff, et al. Once we have the percentage of income allocated to healthcare premiums, then we could start to have a meaningful conversation. Until the data makes sense, this data is uninformative. The national healthcare taxes on Obama care are going to be squashed long before they can be implemented. I'm starting to think you may have a point there Kiers. Maybe the US should look at how insurance in other countries are handled to get an idea how to do things right. I heard philippine prudential life in particular was pretty good at what it does. There should be health insurance for Americans that gives them emergency medical evacuation to a cheaper country.